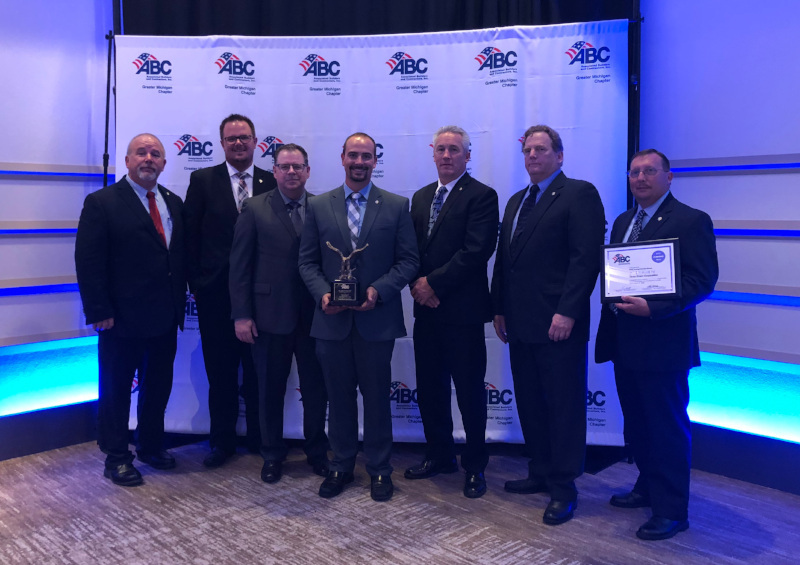 Three Rivers Corporation was recognized with two awards from Associated Builders and Contractors (ABC) Greater Michigan Chapter’s Greatness & Gratitude Awards Celebration on Thursday, September 13th at the Kellogg Hotel & Conference Center in East Lansing. They received awards in the Excellence in Construction category, as well as a Diamond award in the Safety Training & Evaluation Process (STEP) category. Each year, the ABC Greater Michigan Chapter provides an opportunity for members to compete for honors in the construction industry’s premier annual awards program: the Excellence in Construction (EIC) Awards. The EIC Awards recognize the outstanding Merit Shop construction projects completed during the previous year by member companies. These awards distinguish the level of construction standards throughout the industry by recognizing the workmanship of those who contribute and by showcasing results of their dedication. Teamwork and collaboration between general contractors, subcontractors, and material suppliers are part of the fundamentals for building excellence and quality into any construction project. Submitted entries are judged on a project narrative, detailed description of the construction process, time, budget, and space restrictions, and any special challenges associated with the project’s completion. Now more than ever, design and construction projects must be innovative to keep up with ever-evolving economic, environmental, and aesthetic demands. ABC of Greater Michigan honored Three Rivers Corporation for their design and construction of West Midland Family Center – GC/CM: Addition/Renovation $1 -$5 million category. The Safety Training and Evaluation Process (STEP) Award recognizes efforts of ABC members who strive to achieve effective safety practices within their companies; it is an organized approach for analyzing and developing safety and loss prevention programs. Three Rivers provides contractors with tools to objectively evaluate their safety programs, policies, procedures and training. “I believe this reflects not just the quality of our safety program but the commitment each of our employees makes to maintain that program every day. Three Rivers is committed to building more than buildings in our local communities. We are honored to receive this significant construction award knowing our work has lasting impression on the community,” said Jon Lynch President at Three Rivers Corporation.